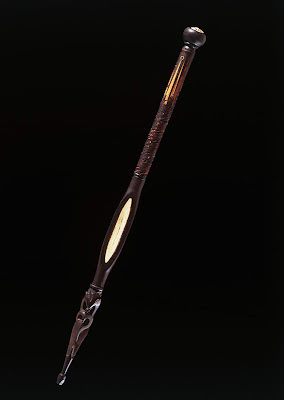 Poet laureates Jenny Bornholdt, Bill Manhire, Elizabeth Smither, Brian Turner and I are scheduled to gather at the National Library in Wellington on Monday 4 August to read and to honour the seven tokotoko (talking sticks) associated with the laureateship. Jacob Scott, who carved the tokotoko, and John Buck from Te Mata Estate will also speak. Hone Tuwhare’s stick has been brought to Wellington for the occasion and CDs by Jenny Bornholdt and Bill Manhire will be launched. If the winter storms let up sufficiently to allow more than seagulls into Rongotai on Monday, a great night of poetry and stories about sticks is in store. Reception at 5.30 pm in the Main Foyer of the Library, followed by reading and launches 6 – 7.30 pm in the Ground Floor Reading Room. MC Kate Camp. Hosted by the National Library as part of IIML’s 2008 Writers on Mondays series.